HENIN-BEAUMONT, France — This former coal-mining town of 26,000 languishing in the economic badlands along the border with Belgium is about as far as you can get from the postcard image of this country as a land of wine and romance. Street after street of red-brick row houses lie in the shadow of mountainous spoil tips left behind by long-dead mines that once attracted waves of migrant workers from Italy, Poland and North Africa. Downtown, shuttered stores are common. Among those that survive, traditional patisseries and charcuteries — bakers and butchers — are outnumbered by Turkish fast-food joints plastered with garish photos advertising kebab and fries. In the cafes, men wearing tracksuits drinking mid-morning beers are a reminder that the 17 percent unemployment rate here is among the highest in France. Since March, Henin-Beaumont has also been a National Front town. The ultra-nationalist party swept to a landslide victory here in municipal elections, ending decades of left-wing rule. Now the party is hoping to repeat that success at a national level by harnessing voters’ anger with the political mainstream to become France's biggest political party in this week's elections for the European Parliament. "They promised us prosperity, we got recession," party leader Marine Le Pen told supporters at a rally last week. "They promised us strength, we got dependence and humiliation. They promised us security at Europe's borders, we got Romani camps and out-of-control immigration." That kind of rhetoric is striking a chord across France. A poll Monday showed the National Front leading the pack with 23 percent, ahead of the mainstream conservative opposition party with 21 percent. The Socialists of President Francois Hollande had just 17 percent. That picture is being repeated across much of the European Union as its 380 million voters prepare to vote (or abstain, as many do) in the world's second-largest democratic selection after India's general elections. Elections begin on Thursday and last through Sunday. Far-right parties and other radical new forces opposed to the European Union are polling first or a close second in nine of the 28 EU countries, including Britain, Italy and the Netherlands. Although there are a myriad of local factors at play across Europe, the discontent that led Henin-Beaumont to embrace Le Pen helps explain why voters around the continent are looking for radical solutions. Voters here say previous administrations' corruption and mismanagement are the main reasons for the rightward turn. There’s much to complain about. The long-serving Socialist mayor, Gerard Dalongeville, hiked local taxes 85 percent in 2004 in an effort to reduce one of France's highest levels of municipal debt. Five years later, he was dismissed by the national government amid a storm of corruption allegations before receiving a four-year prison sentence for embezzlement in August. "The way the town was managed was catastrophic," says local teacher Paul Tondelier. "There was a huge disappointment with the Socialists and people said at least the National Front people weren't involved in all those shenanigans." At a national and European level, Le Pen and other radical leaders on the left as well as right have seized on voter dissatisfaction with traditional parties. Hollande has seen his popularity ratings plummet to 18 percent just two years after he was elected with 51 percent, by voters disenchanted with his center-right predecessor Nicolas Sarkozy. With mainstream leaders across the spectrum failing to answer citizens' concerns over the stagnant economy and rising unemployment, the National Front is finding fertile ground for its kick-the-bums-out message, coupled with populist solutions like a return to protectionist trade restrictions and tougher immigration controls. Parties like the Five Star Movement of rabble-rousing comedian Beppe Grillo in Italy and the far-left Syriza party in Greece have tapped into similar voter discontent to challenge for the top spot in their countries’ European elections. Attacking the European Union has become an even bigger vote winner. The French were once solid supporters of greater unity across the continent, dismissing euro-skepticism as an annoying eccentricity of their neighbors on the other side of the English Channel. Just 39 percent of French voters now think the EU is "a good thing," according to a poll published Monday by daily newspaper Le Monde. Here too, Henin-Beaumont was ahead of the national curve. In 2005, 75 percent voted “no” in a referendum on a treaty designed to give more powers to the EU, compared to 54 percent nationally. "Europe is really not popular here," says Christophe Le Couteux, a journalist with the regional newspaper La Voix du Nord. "There's a feeling that Europe does not defend jobs, that Europe supports neo-liberalism, that it favors factory closures. Europe is detached from people's lives." Factory closures in the early 2000s were partly blamed on EU laws allowing companies to relocate to countries with cheaper labor costs. More recently, the EU has come in for criticism here and across southern Europe for imposing austerity programs demanded by Germany and other northern countries in exchange for bailout programs. Conversely, euro-skepticism in the north has been fueled by populist parties claiming taxpayers' cash is diverted to support spendthrift southerners. With France straddling Europe's north-south divide, Le Pen has been able to exploit both arguments to ride a wave of anti-European feeling. "Europe has brought nothing good, there's more unemployment, everything is more expensive," says Evelyne, a retired accountant in Henin-Beaumont who declined to give her full name. "We were better off how we were before." Le Pen is calling for a break up of the euro currency, a drastic reduction of powers for EU headquarters in Brussels and an end to policies allowing Europeans to travel and work freely across the bloc. He says negotiations with the US on a trans-Atlantic free trade area should be abandoned and trade barriers against other European nations re-introduced in the name of "economic patriotism." 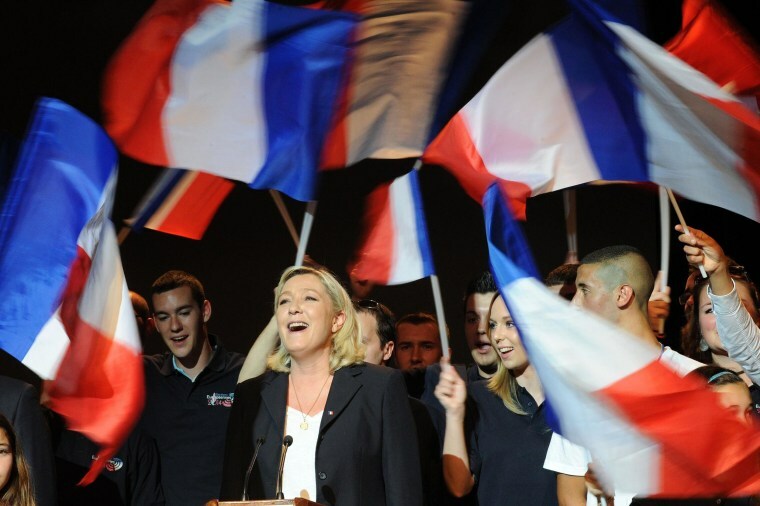 Northern rightists may not be as gung-ho as Le Pen on economic protectionism, but they agree with her on the need to roll back the EU's powers. Some want to break up the EU, which was founded in the 1950s with the goal of uniting countries whose 20th-century rivalries twice led the world into war. Ending EU labor movement rules has been a rallying call for the nationalist right from Italy to Denmark since the bloc expanded a decade ago to include the former communist countries of Central and Eastern Europe. Le Pen's election material complains the EU "forbids us from mastering our own frontiers and stopping massive immigration." In Britain, the UK Independence Party, which is topping polls, has refused to join a coalition of European far right-wing parties being put together by Le Pen and Dutch Freedom Party leader Geert Wilders, claiming they are racist. But UKIP is running a campaign associating Eastern European migrants with unemployment, crime and benefits abuse. "Any normal and fair-minded person would have a perfect right to be concerned if a group of Romanian people suddenly moved in next door," UKIP leader Nigel Farage said in a statement Saturday. Le Pen has also sought to refute accusations of racism and authoritarianism against the National Front in an effort to make the party more respectable to middle-of-the-road voters. However, critics point to the actions of party mayors after their capture of 11 town halls in local elections in March. In Henin-Beaumont, Mayor Steeve Briois quickly moved to evict the local branch of France's Human Rights League from municipal property. One of the first acts of Mayor Franck Briffaut in Villers-Cotterets, an agricultural town northeast of Paris, was to terminate municipal support for an annual commemoration of the end of slavery, saying it encouraged "fashionable guilt" over France's colonial history. The event was held in honor of Thomas-Alexandre Dumas, a general in Napoleon’s army whose mother was a Haitian slave. Dumas' son, The Three Musketeers author Alexandre Dumas, was born in Villers-Cotterets. If polls are correct, radical right-wing parties are likely to grab around 90 of the 766 seats contested in the European Parliament elections.